Do you Pin? As in Pinterest? For the unenlightened, Pinterest is the darling social networking site of 2012. It's a virtual pin board. It allows members to organize and share anything that interests them by "pinning" images on a theme board. Sort of like a digital scrapbook. 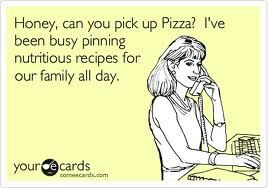 People have become so addicted to Pinterest they call it, pinsanity. A lot of stuff on Pinterest is aspirational. Wishful thinking. Collage displays of travel spots you dream of visiting someday or clothes you'd really love to wear when you lose that extra 30 lbs. Recipes are popular on Pinterest too. My friends who unabashedly adore Pinterest, admit that it's often more fun to look at mouth-watering food pictures than get up, walk to the kitchen and actually cook...in real time. 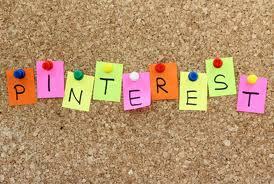 In the United States, females make up 82 percent of Pinterest users. But outside of the U.S., Pinterest members tend to be mostly male....57 percent men in United Kingdom, 79 percent men in Japan and 74 percent men in France. Hmmm...I wonder what the trendy Pinterest themes are in Paris? Honestly, I don't have much interest in Pinterest. I was invited to join by friends and so I did. But I just couldn't get hooked on it. It involves a LOT of time. Facebook is my social media drug of choice. I don't fault anyone who uses Pinterest but I often wonder how they find the time to peruse all the stuff that's on it. Frankly, Pinterest gives me an inferiority complex. Like I need another one. There are all these millions of women on Pinterest every day, who display photos of how they make their own candles from scratch, whip up 12 layer cakes, boil their own cutesy soap in the shape of reindeer, plan extravagant menus fit for royalty, redesign the interior of a cruise ship, work up chic decorating ideas for a mansion most of us could never afford to own, and cleverly clip garden shrubs into topiaries that resemble each member of their family. Me? I'm just lucky to drive to the Post Office, buy stamps and not have an accident on the way home. Oh dear God. Twitter, facebook, and now Pinterest? I'm afraid to look... :) Great post! It's a crazy online world. I use it to organize things I find interesting as I find them. I don't go looking for stuff to pin. I don't have that kind of time or interest. Ha!